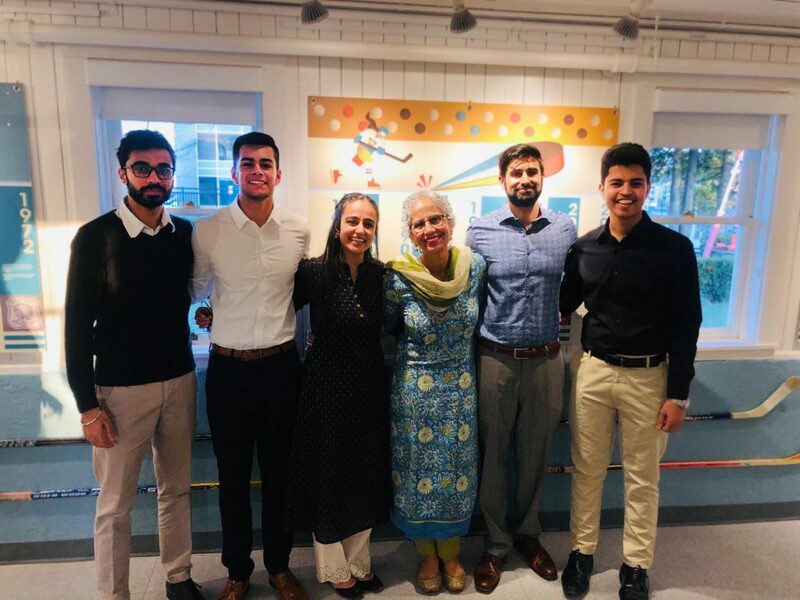 On March 29th, 2019, the South Asian Studies Institute at the University of the Fraser Valley hosted the opening reception for the ‘We Are Hockey’ exhibit. This exhibit is a vibrant, historically rich, counter narrative of Canada’s beloved sport: hockey. Centered on the experiences of peoples of colour, this exhibit challenges singularly racial perspectives on the meaning of Hockey as Canada’s national sport while negotiating the often ambivalent, yet very relevant interrogations of race, ethnicity and the privilege and power of settler communities. The opening reception was a great event with a strong community presence and an overall positive feel surrounding the Gur Sikh Temple underneath a sunny evening sky. The Vancouver Canucks, as a community partner, brought a large hockey inflatable for the kids to play within the courtyard, and the fun-loving mascot, Fin, was on scene to take pictures and sign autographs. Dr. Joanne Maclean, UFV President and Vice-Chancellor provided a welcome address from UFV. Mike De Jong (MLA), Jati Sidhu (MP), Henry Braun (Mayor of Abbotsford), and Perm Jawanda (VP, Partner Retail, Rogers) also each provided positive words of support and added weight to the significance of the exhibit. We are grateful to Dr. Courtney Szto, whose PhD research has helped shape the exhibit. Without her thought provoking and much needed research, the exhibit would not have come to fruition. The support from the sponsors: Rogers, Cross-Connect Media, and the community sponsors: Vancouver Canucks, Apna Hockey, SFU Communications, was phenomenal and helped bring this incredible story to life.